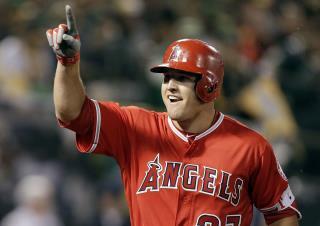 (Newser) – Mike Trout is about to score the largest contract in baseball history—and possibly in sports history. Sources tell the AP that Trout and the Los Angeles Angels are close to finalizing a $432 million, 12-year contract; that would put him well beyond the current baseball record holder, Bryce Harper, who just weeks ago got a $330 million, 13-year contract to move from the Washington Nationals to the Philadelphia Phillies. The Wall Street Journal calls Trout, 27, "the game's best player," and notes that his average annual salary ($35.8 million, per Sports Illustrated) will also set a record in the sport, topping Zack Greinke's $34.4 million with the Arizona Diamondbacks. A lot of eggs in one basket. The baseball biz must be good. "This Is the Sports Contract to End All Sports Contracts" except, no it's not. NOWHERE NEAR!!! Contracts for athletes is going to keep ballooning. Don't be fooled in to thinking "this is the one to end them all"
I would love to see a contract that pays $1m a year with the rest incentive based.